Don’t you love it when a project turns out better than you expected? I always have grandiose ideas and sometimes they work out and sometimes not so much. Much to my delight, my little antiquing project turned out great! I bought this cute little table a few months for $20 at an online garage sale. The marble top was cracked and the base was wobbly. I glued the top together and glued and clamped the base to provide stability. (with E6000 glue, of course!) It was ready for it’s makeover! At first I was going use dark wax to antique the table, but I bought a bottle of Valspar Antiquing glaze instead. The glaze is dark and thick. I’ve never used this type of medium so I was curious to see how well it worked using a glaze versus sanding or wax to age a piece of furniture. I painted on a heavy coat of glaze using a bristle brush that was small enough to fit inside the mouth of the jar. I made sure I worked the glaze in all of the nooks and crevasses. Working on one section at a time, I brushed on the glaze, and then gently wiped off the excess with an old t-shirt. (I love using my husband’s old t-shirts for this type of project. The cotton is soft and doesn’t leave behind any fibers and you can throw them away when you are finished.) Be sure to look at the project from all angles to make sure nothing is missed. This is how the first leg looked after the glazing process. I loved it! The entire glazing process took about an hour. I let the glaze dry completely then I rubbed on some light Amy Howard wax to seal the paint and glaze. I love the aged look of the piece and how the details really stand out now. I really love this little table now! 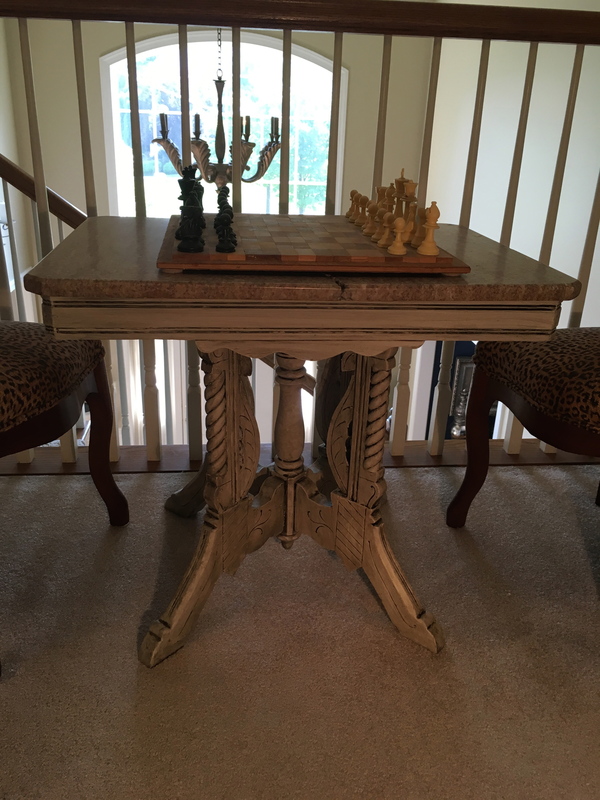 It is nice and sturdy and will make a great little game table or side table. Not bad for $20 and a little elbow grease! I am now a huge fan of antiquing glaze! It is very easy to use and cleans up with soap and water. I should wear gloves when I do these projects, but I find they get in my way, so I’m thankful for the easy clean up. The glaze goes a long way. I used only about a third of the container so I have lots left for future projects. I think I have something else in mind for this glaze! Have a wonderful weekend!